In the middle of this big question about the season’s direction — is The Crown going to focus on Philip’s side of the marriage, or finally do a deep dive into Elizabeth’s inner life? — we now turn to an episode that is by and large devoted to … Princess Margaret! Since we last saw Margaret in season one, embittered and denied her love match because a princess couldn’t marry a divorced man, she has grown increasingly unhappy. In case you’d forgotten, or in case you needed a refresher on exactly how unhappy she’s become, we rejoin Margaret at the wedding of her friends, where she skulks around like an exhausted, disillusioned crone. She chain smokes and drinks to excess, and finds herself (sort of) engaged to her friend Billy Wallace, essentially because she’s too tired of herself and her life to argue with him. Billy is a disaster, of course. For a series that’s often surprisingly unwilling to take a strong stance on real people (see: Elizabeth’s vague distance, Philip’s sympathy tour), The Crown does not hold back on poor Billy Wallace. The method of cutting back and forth between his slightly drunk account of the duel to Margaret and flashbacks to the event itself is unmerciful to dear ol’ Billy, who gets dragged to the duel by his friends as he weeps and protests. He’s barely sober enough to walk, seems to have lost his shoes somewhere, and is just the most pitiable mess you could imagine. Margaret is disgusted. The engagement, which never even had a chance to happen, is off. Before getting to the Goode stuff (see what I did there? ), “Beryl” gives us several sequences that show Margaret falling apart. The photo session with Cecil Beaton is the best one, and it’s a good illustration of one of The Crown’s best features: the way stodgy, idealized abstractions of the royal family harm people on both sides. It’s an obviously frustrating and impossible situation for Margaret, who’s stuck in an absurd fairy-tale version of a life that’s growing farther and farther from her reality. It’s even worse for the people that the fairy tale is meant to inspire: That amazing, wrong-headed Beaton monologue about the dreary scullery maid whose life is made better just because she had a chance to look at a famous wealthy person in the newspaper for a moment is the closest The Crown has gotten to anti-monarchist sentiment so far. For further evidence of Margaret’s sadness, there’s also a scene where she gets loaded and listens to Ella Fitzgerald while having an almost-breakdown in her room. Her new lady-in-waiting, Elizabeth Cavendish, watches in obvious dismay, but it just feels less necessary than the Beaton photography scene. We get it — she’s not doing well. Margaret decides to go to a dinner party hosted by Cavendish (in search of “normal” people, which reminded me of nothing so much as Russell from Almost Famous off in search of someone “real”). She’s lonely at the party. She doesn’t know anyone, and everyone is awkward around her. Enter Antony Armstrong-Jones, who immediately gives Margaret the good gossip and gets under her skin. They talk about his photography and how much it’s like intrusion and intimacy. They talk about the stuffiness of traditional portraiture. It’s not negging, exactly, but it’s related — he’s just deferential enough to demonstrate that he knows how he’s supposed to behave around her, and just suave enough to seem like he could care less about her title. As Margaret tells Elizabeth later, it seems like he has contempt for her and for the entire royal institution. And if there’s anything Margaret is down for, it’s contempt for the royal family combined with an obvious desire for all the trappings and importance that come with it. She and Tony seem meant to be! So Margaret goes to his studio and Tony performs his well-oiled routine. For the But Historical Accuracy! viewers, I’ll note that Antony Armstrong-Jones had already taken a few royal photographs before he and Margaret connected in 1957. In a more spoiler-y way, the naked photo of Princess Margaret was taken much farther into their relationship, and would be accompanied by other quite scandalizing images of her throughout their time together. 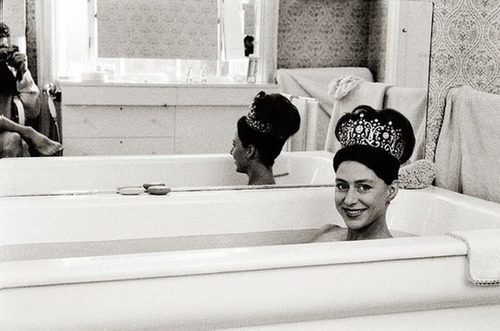 My favorite of these is Margaret immersed almost fully in a bathtub, wearing one of the royal tiaras. It’s a stunning, shocking image, and it’s even more scandalous because you can see a glimpse of Tony’s legs reflected in the bathroom mirror. The precise timing of the photo from “Beryl” might be a bit off, in other words, but the intimacy and intensity feel right. Similarly, it’s hard to say whether Margaret did indeed hop on the back of his motorbike after their second meeting, but Armstrong-Jones was a notorious motorbike fan. It’s possible that these hypersexy scenes of Margaret and Tony’s first encounters are what their early relationship was like. Who knows? Maybe he did walk past her as she leaned over a darkroom table, brushing his groin against her while she commented archly that her guess about his sexuality seems to have been wrong. But for the sake of accuracy, I will say this: That is not how darkroom photography works, Tony. When did you have time to develop the film?! It seems likely that much of the next several episodes will be devoted to what comes next for Margaret and Tony. And I do not begrudge The Crown for indulging the drama of Princess Margaret. How could I? She had the most colorful and controversial life of any royal from the ’50s and ’60s. She was the sort of person with an envy-worthy morning routine, the kind of person whose photos are given captions like “the famously sybaritic Princess Margaret.” It’s weird to call known historical events “spoilers,” and yet, if you’re watching this and don’t know the history, I will try not spoil too much of it for you here. But suffice it to say, the relationship that’s budding between Margaret and Tony is going to make for some good television. How could ever I resent The Crown for using such good material? We may not know much about Elizabeth, but we do know that Margaret is absolutely delighted to have found Tony Armstrong-Jones. And thanks to the portrait published in the newspaper, everyone else in the country now knows it, too. It’s going to be an exciting time for royal publicity.